Been wanting to put this ship against a nice blue background. If anyone knows who the author is, please let me know. That ship looks like what Kirk needs. Something making Star Trek great again. "Diplomacy for Kirk are a phaser and a smirk." Kirk would definitely had fun with the type 12 advanced phaser arrays and quantum torpedoes, especially the micro torpedo turret. Problem with everything Star Trek that was made after TWOK is that the torpedoes have physical bodies. In TOS, they were blobs of energy, so they were unlimited. It's also easier to explain where the light comes from. That's what I never understood about the warhead torpedoes. Where does that firetrucking orange glow come from? Also, the torpedo launch bay in TWOK was only added so the could bring a more military feeling into the movie. Spock getting shot out from one was not the main reason. And what do you prefer for a futuristic movie? Energy blobs that are encased in a force field, unlimited numbers, or physical torpedoes that have to be slowly loaded, fire rate of about one every ten minutes, and limited in number? There's also the fact that the physical torpedoes don't seem to have a proximity detonator, while the TOS torpedoes do have one. Compare Balance of Terror to The Undiscovered Country. 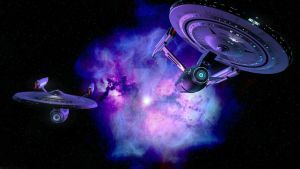 TOS Enterprise wouldn't have sat there like a sitting duck, but fired proximity charges. Somehow I doubt in TOS their torpedo count was unlimited. Even if you are right, and the torpedoes weren't physical, which I highly doubt, whatever made them explosive would have required some form of material that would have been limited in supply. Also, if they weren't physical in any form, how could they have a proximity detonation feature, and how would their force fields maintain cohesion. Once fired, there would be no way to maintain both, so there would have had to be some physical components to the torpedoes either way. How you would explain the original plasma torpedoes that the Romulans used in Balance Of Terror, not sure. 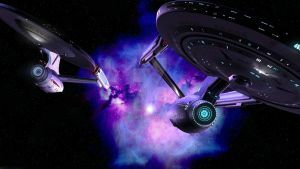 Would the concept of the TOS Enterprise torpedoes being just pure energy explain how the torpedoes were lit, yeah, but even with physical torpedoes, one could argue that their light flare comes from their onboard propulsion systems, which allow them thrust. Also, remember, in Balance Of Terror, the Romulan cloak wasn't perfect, and was one of their earliest generation of cloaking devices, so the Enterprise could see a sensor wake or shadow that the Romulan ship could detect. This would allow the Enterprise to fire some torpedoes in a general area, and detonate on anything near what their onboard sensors would detect to be a potential object. However, if I remember correctly, the torpedoes didn't detonate with a proximity detonator, but were targeted to a specific area in a dispersal pattern and programmed to detonate once they reached that specific area. The explosions would have rocked the Romulan ship, and since while cloaked they had no shields, the torpedoes didn't need to hit to cause damage. Even proximity torpedoes need to be fired at a specific general area where the enemy ship is believed to be, or else you're just wasting ammo and time. 1. Ask Promus-Kaa, he figured it out, while I already forgot about 50% of it. 2. I also thought about that, but the effect somehow doesn't match. Can't point anything out, though. 3. Actually, that was phaser fire. I think the proximity detonator was merely the force field breaking down due to the gravitation of the enemy ship. And the fire pattern is the bubble strength set to dissolve at a certain range, detonating the energy. About wasting ammo and time, you can track a ship by its muzzle flash. It's been a while since I saw Balance Of Terror, so yeah, could have been phaser fire. However, pure energy, even in space, would dissipate rapidly, unless it was continuously supplied by the source, such as the phasers in TNG, and some in TOS. And muzzle flash only really gives away a cloaked ship in space if you see it physically. Sensors wouldn't register the muzzle flash since most likely any energy discharge would also be cloaked by the ship. Remember, the only thing the Enterprise had to detect them was a neutrino surge, and they would need to be right next to them to detect it. Now, the equipment they put in that torpedo to track the BoP, they could have used some of it to modify their targeting sensors to allow them to get a bearing on the BoP, but something tells me it would have taken a bit too long for the targeting sensors to track the BoP emissions and then fire, which would have allowed the BoP to change location, keeping one step ahead. A torpedo with a modified guidance system and it's own on board propulsion, better. This really is nice. That is one of those images that say "Star Trek" without any question. Exploration of new worlds at its finest. :-D Thanks for saying so. I wanted this image to show that the ship class has been reborn with the Resurrection refit.